TotallyYourType: Public Typing: Just Do It! Public Typing: Just Do It! Great! You are especially correct about the freindliness of the area where you live. I lived in Franklin County for years and there is quite a bit of difference from PA or FL in the people. I could write an essay for a comment on it. I seldom type out 'in' public. I do often type outside in the public though since it is so easily done nearly year round here. We have several places of business as well as many places in the parks and at the beaches where I ride my bike and do some bicycle typing. why would I want to write in public? Why would I want to take the risk of people interrupting my writing flow - even if they are friendly and interesting to talk to? Why would I go out into a world that will most likely cause my attention to wander off instead of sticking to my story? Why would I leave my writing space at home where my mind has only the well-known sights and sounds and therefore will not be distracted from writing that easy? Or is this something mainly for people that in some way either do not care about a writing flow or just have a higher priority on "see and get seen" than in writing itself? Or is it some sort of show-off of the typewriter? Like cruising with the sports car through the city without the real need to get to a certain place? Or is it for people that need to be in public, in a bar, etc. - and see and hear other people in order to get ideas, in order to get inspired? I am quite puzzled. For me personally, the idea of writing in public is quite far away. I see it that way, that collecting typewriters can be quite a successful way of keeping yourself away from writing. 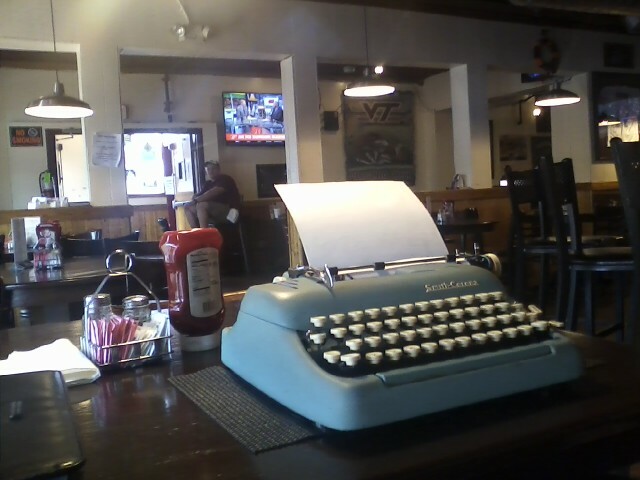 And the idea of taking the typewriter out into public seems to me personally even one step more into that direction. If one is serious about writing, one single typewriter in one reasonable quiet place should be plenty enough, I would think. But that is probably just my narrow-mindedness. It certainly is narrow-mindedness! It might be the case for you that you cannot work with distractions or background noise, but it is the case for many others where that is helpful. I even know at least one person who tunes into live feed audio of a coffeeshop when he works because he finds silence distracting. I have tried writing under lots of different conditions and I think I take it fairly seriously and working with noise in the background works very well for me. Sometimes interruptions of people asking questions does interrupt my "flow" but more and more it does not. I think it has made me a more disciplined and mature writer. I'm a little insulted by some of the implications in the way you chose to present your opinion. I am aware lot of writers DO like to work in silence, and most serious writers I know are interested in how others work and are aware that the techniques they use and preferences they have are not necessarily the "right way" to work. Also "collecting typewriters can be quite a successful way of keeping yourself away from writing".... really?!? I suppose any devotion of time to anything but writing would technically be keeping one away from writing but typewriters, if anything, are something that draw or inspire many people towards writing. There have been countless times I didn't particularly feel like writing but wanted to use a specific machine and ended up writing something quite good. I value your counterpoint but I'm turned off by your narrow-minded and mater-of-fact attitude. At least you are aware of it. I did not intend to insult you at all. I apologize if it came out that way. It might be due to me not being a native speaker of English and I probably could not really express what I meant and how. I did not want to address you in particular, but more the people who type in public (or plan to) in general. I read quite a bit from you in the past here on your blog and also on the TWDB and I was quite aware when I wrote my comment that 90% of the written would not apply to you personally. I tried to come to a different point. If you want, the counter-argument to yours. You said "Go out and type in public!" and I simply wanted to hold against that strongly and say "Before you do this, first come to know WHY in heaven you want to do this!" Because if those people then realize it is just for that kick to get some attention then it would be a terrible idea. I truly believe that for the majority of people, it is not such a good idea. Because most people will be distracted. There might be a few that don't get distracted or others that kind of deeply inside want to get distracted, but for the great amount of rather not-so-skilled-writers out there, going to a crowded place would make no good for them. It might truly work for you. But I simply would be quite careful to tell all writers out there to do the same. To me this seems like talking to people who have never seen water before and tell them to jump right in because I tried it and it turned out to be a lot of fun. Just because I might be a good swimmer by talent doesn't mean that my advice will not do bad to others. The collecting of typewriters can absolutely be a successful way of keeping yourself away from writing. Simply because that hobby needs a lot of the most precious thing a writer has: his/her time. Buying a typewriter takes time. Cleaning it takes time. Repairing it takes time. Making pictures of it takes time. Uploading it to the typewriter database takes time and so on and on and on. Do not get me wrong: I am 100% guilty of that. I have done that myself - although not to the amount of typewriters that other real collectors do, but anyway it surely has eaten quite a lot of time. Time that I could have spent on reading and writing. And if I am totally honest to myself, I can see clearly that for becoming a better writer these two should be my only real concerns. I stand by the argument that a writer or anyone who makes art should try many different things. To not try something is to never know whether it does work for you. I have a lot of relevant experience and everything you say rings true. The comment above makes a good point that if you don't want interruption a typewriter may not be the best choice, but on the other hand, it's only by collecting that I was able to determine which machines I like the best for writing. Definitely the only way to go is to encourage those who show interest. They will deflect any criticism from others. I make a point of doing my public typing where kids will be (see my posts on Kidical Mass rides). So keep up the good work as an ambassador of the typosphere!